There have actually been two releases since the last Readerware Newsletter so we have some catching up to do. Readerware 3.55 is now available for Windows, Mac and Linux. Readerware Mobile 3.55 is also available now for all mobile platforms, Android, iPhone & iPad and Windows Mobile. Yes Readerware Mobile is now available for Windows Mobile devices. All can be downloaded from the appropriate app store. Readerware now supports an alphanumeric sort option so that you can sort fields containing both alphabetic and numeric characters. 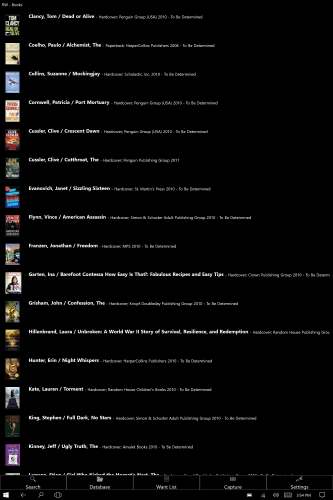 Readerware auto-catalog and drag & drop now display an error when Amazon returns a site overloaded error. If you run into this problem, take a break or use another site. If you keep trying it will probably make the situation worse. You can now add the Borrower ID column to the table view. The report writer template system was missing keywords for seller related fields. These have been added. Changed the mode setting in the Readerware loan client that some users found confusing. Readerware Mobile is now available for Windows 10 mobile devices. Readerware Mobile can now export the mobile database. This can be used to recreate your Readerware database from the mobile version. Not all data is recovered but if you have lost everything else it can be useful. A full list of the changes included in Readerware 3.55 is available in the release notes. You can also access the release notes from Readerware itself, select the Help->Release notes menu item. We recommend that everyone upgrade to Readerware 3.55. Readerware Mobile is now available for Windows Mobile 10, you can download it from the Microsoft store. This includes not just Windows Mobile 10 phones and tablets but also the new 2 in 1 PCs that have a touch screen, often a detachable touch screen. Like the Microsoft Surface Pro or HP Spectre x360. This version does not include scanning and there are some problems with table displays on some devices that we are working on. Other than that it is very similar to Readerware Mobile on other platforms. RW - Music on a Microsoft Lumia 640 LTE phone RW - Books on a Microsoft Surface Book Laptop running in tablet mode with screen detached. Readerware Mobile now transfers the disc title to your mobile device if present. Whenever you export tracks, the disc title is now included. Existing users will need to delete their mobile database first. The disc title will be transferred on the next sync. All programs now do this. In Readerware Mobile the invalid ISBN/UPC sound now plays on all platforms. You can now transfer a Readerware Mobile database back to your computer and create a Readerware database from it. Readerware Mobile should not be considered a backup as it does not contain the full database. But if disaster strikes and you lose your main database, a Readerware Mobile database is better than starting over. The export function will create a CSV file containing the data from your mobile database. You can transfer it to your computer and import it into an empty Readerware database. It is recommended that you regularly backup your database. This question comes up quite a bit but it is not something that is included in Readerware, There is no browser access to your Readerware database. It is possible to export your database to HTML and upload static pages to your website, but that is less than ideal. A Readerware user has started an open source project on GitHub that lets you create an Online Public Access Catalog (OPAC) for your library collection. This project displays your library in a convenient format, you can sort by author or title and you can display images by holding the mouse over the title. Rather than just include a screenshot of how your website database would look we have used this project to create a small database on the Readerware website. You can access it here. Click on the Title or Author link to sort your database. Hold the mouse over a title to display the cover art. Both MySQL and PHP are common web technologies so chances are your web site does provide access to them. Now you need to download the the open source OPAC project from GitHub. There are just a few files to download. Press the 'Download ZIP' button which is located under the "Clone or Download" drop down list. Unzip the files. You have to edit the Config.php file to enter your database server name, login, database name etc. Finally upload these files to your web site. You should probably install then in a folder. For example we created a library folder on our web site and stored the files in there. The link [url=http://www.yourwebsite.com/library]http://www.yourwebsite.com/library[/url] will display your library collections. There is a knowledge base article on using the Online Public Access Catalog (OPAC) for Readerware here. This is a great project which a Readerware user created for their website and then donated to the community so that others can use it and build on it. We hope you will find this project useful and contribute to it, contributing changes back to the project means that all Readerware users can benefit from it. A question on sorting that comes up quite a bit is sorting text fields that also contain numbers. Alphabetically 1 comes before 3. Readerware recently introduced a new alphanumeric sort option. Select the Preferences menu item, then Views. What happens is that Readerware now recognizes that in the middle of these text lines there is some numeric data. Readerware breaks the line apart and sorts each section appropriately as text or numbers. This was implemented as an option in case it caused unexpected problems. This option has been available a while now and does seem to be working well. So if you have situations like this where you need to sort numeric data in text fields, try this option.